We have a wide variety of Gel candles, More pictures and more information to follow. Please check back for updates or email for pictures or requests! Some candles have a mixture of Soy and Gel to create "look a likes" that we do with gel but are more food like or non transparent items. They are beautiful and versatile and can be made in may ways! So many we cant' list them all, so its up to you! Have an idea or use one of ours. We'll try to make it just what you want. Medium shown in picture. 9" is a regular full size pie and looks similar. These are handmade and each one will look slightly different. 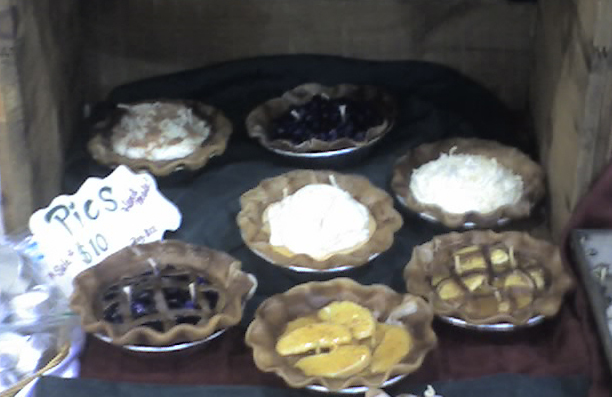 Fresh Baked Pies: Yummy pies that look like the real thing, and smell like it too! Smell the warm crust & spices with delicious filling. We make Apple, Blueberry, Pecan, Chocolate Crème, Coconut Crème, Vanilla Crème pies! Small 3" ☻ Medium 5" ☻ Large 9"
Brownie Sundaes: Yummy sundaes that look like the real thing! Smell the rich brownie and hot fudge with a scoop of ice cream in many flavors! We can add just about anything that will make your candles special. Must be non flammable glass and wax objects work best we also use glitter. pictures may not look exact, they are for example only. some coloration may be different due to lighting, monitor settings, or other variables. Exact pictures of the actual items can be taken for approval on request. Check out our other candles too!